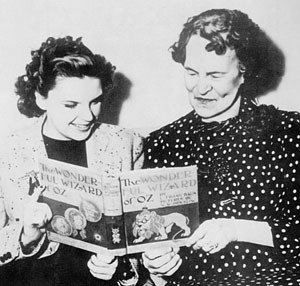 In September of 1939, shortly after the MGM film of The Wizard of Oz was first released, Maud Baum, widow of L. Frank Baum, made a rare appearance on a well-known radio show. tization of the writing of The Wizard of Oz in which we hear the well-known story of how the Baum's received a very large and very unexpected royalty check one Christmas. Maud Baum is then introduced. 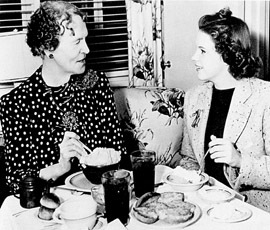 She tells the audience how much the check was for (she inflates the sum to impress the 1939 audience!) and talks about her famous husband. In 1996 this recording was played for Ozma Baum Mantele, grand-daughter of L. Frank and Maud. Ozma listened in rapt delight. When the program was finished Ozma smiled and said, "She doesn't sound like my grandmother!" The woman on the program is certainly offering many genuine Baum family anecdotes; and the woman who is introduced as Maud Baum on the recording does not sound like an actress. So perhaps Maud simply recorded oddly. In any case, here is Maud Baum--believe it or not!